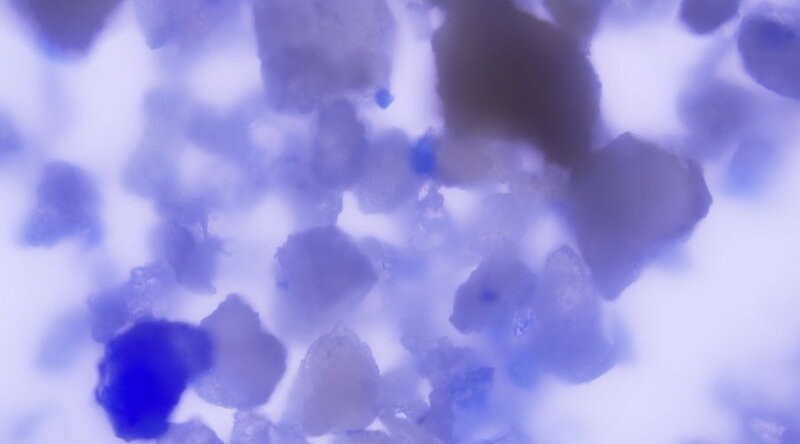 Magnified view of lapis lazuli particles embedded within the dental calculus of a woman from the Middle Ages. The colour pigments are a clear indication that the woman was working as an illustrator of religious manuscripts. Photo by Monica Tromp, Max Planck Institute for the Science of Human History. A team of researchers just published a paper in Science Advances where they reveal that lapis lazuli residues found in the mouth of a woman buried at a 12th-century German monastery suggest that she created richly illustrated religious texts. Prior to this discovery, it was thought that mainly men were allowed to write such manuscripts, whose graphics were drawn using luxurious paints, including gold leaf and ultramarine, a rare and expensive blue pigment made from lapis lazuli. The semi-precious stone has been mined since the 7th Millenium BC, mostly in Afghanistan, a country that remains its largest source. In the Middle Ages, it started being exported to Europe, where it was ground into powder to make the coveted ultramarine. Lower jaw of a medieval woman: the dental calculus contains lapis lazuli pigments which indicate that the woman was working on valuable illuminated manuscripts. Photo by Christina Warinner, Max Planck Institute for the Science of Human History. 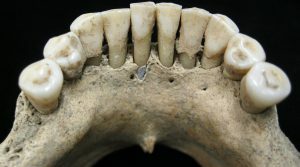 That was precisely the pigment that the researchers found embedded in the calcified dental plaque of a middle-aged woman buried around 1100 AD at a small women’s monastery in Dalheim. In their article, the scientists explain that they ran an analysis using a number of different spectrographic methods – including energy dispersive X-ray spectroscopy, or SEM-EDS, and micro-Raman spectroscopy. This helped reveal that the blue pigment was made from lapis lazuli. "It came as a complete surprise – as the calculus dissolved, it released hundreds of tiny blue particles,” first co-author Anita Radini, from the University of York, said in a media statement. Based on the distribution of the pigment in her mouth, the experts concluded that the most likely scenario was that the woman was herself painting with it and licking the end of the brush as she went. In their view, the lady must have been a brilliant artist because only scribes and painters of exceptional skill would have been entrusted with the use of lapis lazuli. "The unexpected discovery of such a valuable pigment so early and in the mouth of an 11th-century woman in rural Germany is unprecedented. While Germany is known to have been an active center of book production during this period, identifying the contributions of women has been particularly difficult. As a sign of humility, many medieval scribes and painters did not sign their work, a practice that especially applied to women. The low visibility of women’s labour in manuscript production has led many modern scholars to assume that women played little part in it," the scientists said in their press release. The findings of this study, thus, challenge long-held beliefs and open doors to further look into Medieval women’s involvement in the production of illuminated manuscripts.